Professor Grayson is a specialist in higher algebraic K-theory and its relationship with algebraic geometry. He also has played a role in the development of the computer algebra systems Mathematica and Macaulay2. 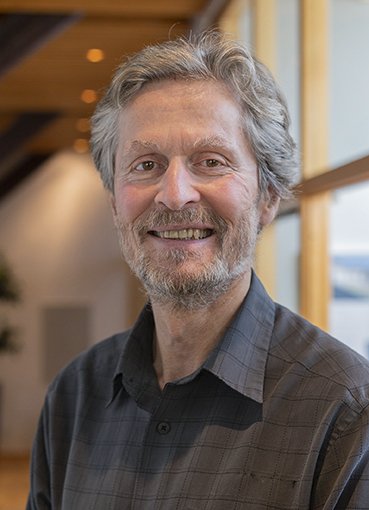 Professor Grayson currently works in Univalent Foundations, a field inaugurated by Vladimir Voevodsky, whose goal is to formalize a large body of modern mathematics, thereby verifying the proofs are correct. Grayson intends to work to understand the logical underpinnings of the system and hopes to formalize the results in a paper of his on algebraic K-theory. My stay at CAS in Oslo for four months during the academic year 2018-19 was a pleasant and worthwhile experience. The staff were uniformly eager to please, the facilities were warm and inviting, the Academy building was elegant, and the city of Oslo was an unforgettable experience. The brand new high-def flat screen monitor just installed in the common area on the third floor was a welcome addition, making computer presentations a snap. Our apartment from Frogner was conveniently located near Solli Plass, with good access to the SATS Elixia fitness center and many fine restaurants there, nearby, and downtown. Oslo is a grand European capital with an interesting history, small enough to be accessible on foot and large enough to offer new dining, museaum, park, and concert experiences during every week of a four month stay. Jogging along the bike path toward Fornebu is a convenient way to keep in shape.